We should get a medal for our Olympic viewing. We have been true red, white & blue fans. We have been behind Team USA one hundred percent. We cheered against the Germans and the Russians. For a while we cheered for our neighbor Canadians, but then they got a little too big for their britches, so we cheered against them. We liked the Scandinavians and Austrians a lot, so we cheered for them too. We recorded events almost every night and we didn't miss much of the exciting 2010 Vancouver games. The best thing was watching the events together. It was so much fun to build family unity while we enjoyed hard-fought victories. The worst thing was watching Team USA lose the gold medal in men's hockey to the Canadians. Now that the closing ceremonies are drawing to a close, the worst thing is looking forward to the 2012 Sochi games. Evan won't be here to cheer for our team. I wonder what team he will be cheering for out in the world. Will You go to Senate Dance With Me X 2? I'm a happy Mama. 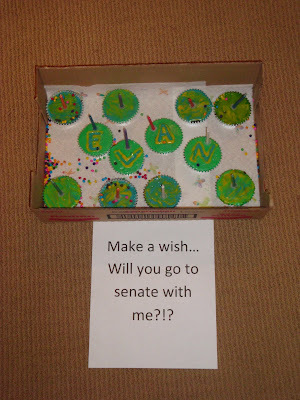 Both my boys got asked to the Senate dance coming up on March 13 (Evan's birthday). Evan had to blow out candles on these yummy cupcakes and find letters at the bottom to spell: LAURA. He's excited to go, but it's his last high school girl's choice dance. Jake had to put these bananas in order to spell: JANESSA. We are so lucky that we get to keep that pretty gorilla too! Jake says he's "sweet" 16, but he can't prove it. I wouldn't even blame him if he weren't. We have all been anxiously anticipating Jake's birthday. He can now be responsible for his own transportation. Mom thinks that is wonderful. On Jake's birthday, we all headed to the Bishop's office for Jake's ordination. While we were there, Jake's friends were busy arriving and preparing for surprising. They even corralled two girls who just happened to come by with birthday cookies for Jake. It was a fun surprise. We grilled and consumed "Puka Dogs"--yummy Hawaiian style hot dogs. They have a garlic secret sauce on them and then we chose from pineapple, coconut or mango relish. They were so yummy. Then, the obligatory cake and presents. It was a fun night. Thanks for turning 16, Jake. Do you remember that classic song from 1982 called "Come On Eileen" sung cheerfully by Dexy's Midnight Runners? "Too-ra, loo-ra, too-ra, loo-rye, aye..."
So catchy. I love it and Jake loves it, Craig--not so much. What grew from Jake's love of the song is a name for his car. We all now refer to her kindly as "Eileen". I have offered to get license plates that say: EILENE or CMONILN, but Jake, ever the Parry, isn't into vanity plates. This is what we do betwen football and baseball season. Basketball is kind of a filler sport for us. It's fun, but we can pretty much take it or leave it. 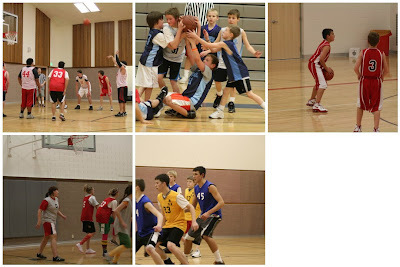 Evan played his last career church ball game a few weeks ago. He almost didn't get to play--tht happens when you get thrown out of the game before. Ah well, passion isn't always a bad thing. Isaac is seen here holding the ball at the bottom of a pile-up. Because of his giantness, you can almost always find Isaac in the middle of the action when he plays basketball and he doesn't mind being an "almost dirty player". Sam, playing with the Bombers this year, was awesome. He is better at 3-point land than he is doing a lay-up. We even joked that he should ask to shoot free throws from the 3-point line. The Bombers are still playing in the post season tournament. Caroline played church ball this year. I just have this to say: Girls are mean. The roughest game I've probably ever seen was between our ward and the 10th ward. Whew. Jake is the rebound king on his teacher's team. And those sharp elbows come in handy too. If you are a short teacher, look out--Jake's elbows will probably come to about your nose and he doesn't mind throwing them. Still playing in region and won the first region game by 40. Sadly, Evan's "handicap" run is coming to end today . We have a boy in our ward who was born with cerebral palsy and is also nearly blind. He's no shrinking violet though as he makes his way in the world. He is a gigantic "U" fan (and lets everyone know it), plays church basketball with the YM and manages all the major sports teams at the high school. Evan has been driving McKay to school for the last year and a half. The perk for this has been the handicap sticker. If he drives McKay, Mac's mom lets Evan use the handicap sticker. They get an awesome parking place every day and occasionally, although politically incorrect, we have used the handicap sticker selfishly when Mac isn't with us. I'm told that McKay's family does this too. Unfortunately for Evan and Jake, McKay's sister, Leah, is turning 16 this week and either wants to drive Mac to school or just wants to use the sticker to get a great parking place. Evan predicts that this arrangement will not last though because, I'm told, Leah isn't exactly prompt. Love Super Bowl Sunday. Love it. It always combines three of the best things in life: Football, Food & Family (Friends is an "F" word too I guess). Yesterday was another great Big Game Sunday. We partied at my mom's this year and had lots of amazing food. We had pizza, yummy island salad, fresh guacamole (amazing), and Ryan's hot wings. In the paper this week, Craig saw some recipes from Indianapolis and New Orleans, representing the two teams playing yesterday. He chose two New Orleans recipes and we teamed up to make some awesome dishes. We had bread pudding with bourbon sauce, which was amazing. When Craig went to buy the bourbon, the worker at the liquor store said, "I'm pretty sure you're over 21, but I'm not positive so I have to card you". Haha. We got a kick out of that. Craig looks awesome and young, but not 20. We also made a "Nawlins" queso with spicy sausace. Both dishes were delish. Lots of people came and it was the usual chaos. People were watching the game all over the house. Most people were cheering for Peyton Manning and the Colts, but Evan and Craig were cheering for the Saints. It was a close game and overtime threatened as the Colts were driving with five minutes left--a touchdown would have tied the game, until Peyton threw a Pick Six that effectively ended the game. Saints 31. Colts 17. I hope my team wins next year, but unless you are really emotionally invested, it's just fun to have an excuse for a party and it doesn't matter that much who wins. No one asked me to vote for the "Sexiest Man Alive" cover of People Magazine. If they had, I would have voted for this handsome trio. 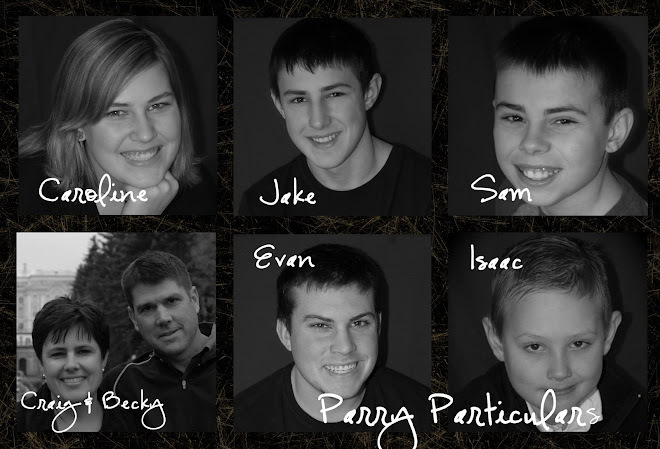 The boys are all spiffed up for the Bountiful High Sweetheart Dance. Don't tell anyone that Jake doesn't turn 16 for ten days. We let him go anyway because he's proven to be trustworthy. Evan took Bree Sieverts to the dance and Thomas took Anna Roundy. They ate at Buca di Peppo's downtown, danced the night away then their group headed to Jimbo's to watch a movie. Jake took Paige Hunt and his group went to dinner at Macaroni Grill then after the dance went to G-Dawg's to play. Sam experienced a right of passage last week that I'm certain he isn't enjoying. Except for the fact that he says he's on a diet and since his teeth are killing him and he's not eating, he's losing weight. Hey, maybe I should get braces again. I don't think anyone ever thinks braces are going to be as bad as they really are, but those first few weeks are killer. 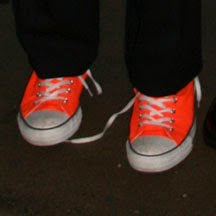 The good news is that Sam will probably only have to wear them for 18 months. Cross your fingers for that. After the first few days, one of Sam's wires went rogue and was sticking straight into his cheek. Lucky for us, Dr. Nelson lives around the corner and will do anything for his hometeachers (Craig & Jake), so we buzzed over and he cut the wire. If you can't tell from the picture, Sam's elastics are navy blue and white in honor of BYU's top 10 basketball ranking.